As I mentioned in Part I of my Skincare Discovery: Cleansing megapost (click here), cleansing is one of those things that people don't reflect on as much as their other products; you stick a soapy thing on your face, you rinse it off, and you proceed with your other products. I know I ordered cleansers with abandon yet I'd research potential moisturizers to death before purchase, but like everything related to asian skincare, my perspective has evolved. Can you believe these were just the products and empties I was easily able to find lurking in my bathroom? If you haven't read Part I, I definitely recommend doing so first for context, but if you're up to speed, read on! 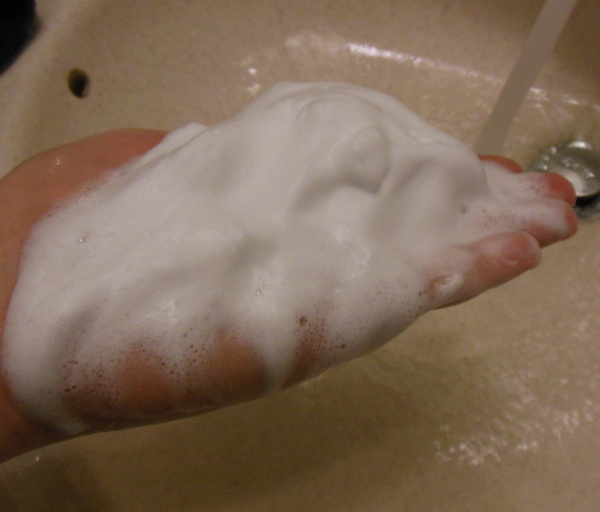 As I mentioned at the end of Part I, I am suspicious of foaming cleansers that foam up vigorously on their own (bubble cleansers excluded) because it usually means there's extra foaming agents in there which don't benefit your skin. For that reason, I often use cleansing tools in combination with my foaming cleansers, which has the symbiotic effect of the lather buffering my skin from the tool (such as the Clarisonic brush or Konjac sponge), and the tool helping to foam up the product so the lather is fully formed before it goes on my face (such as the foaming net) reducing irritation to the skin. Missha's konjac sponge in charcoal (pre-moistened) and in white clay (air dried), Clarisonic brush, and foaming net. 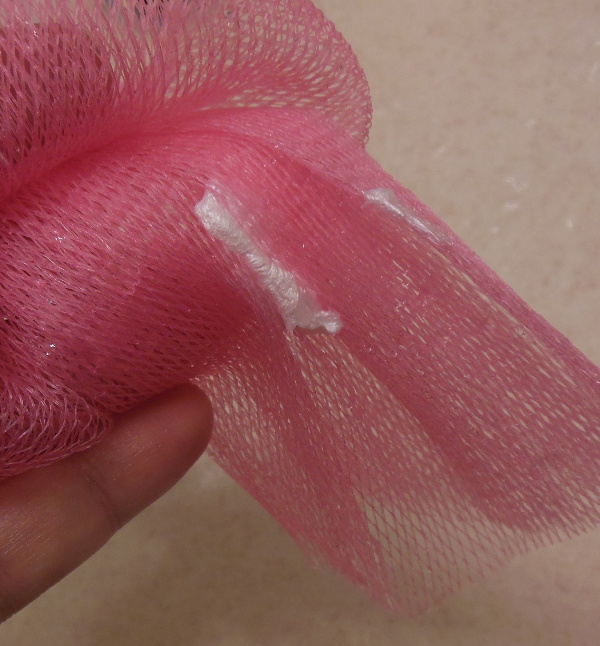 I have a few of these foaming nets, kindly sent to me by a friend in Japan when I expressed frustration with not being able to get the Shiseido FT Sengansenka Perfect Whip Facial Wash (reviewed) to foam up like the commercials showed. You can see a full demo of the net in that review, but this unassuming and cheap little tool can supe-up the lather production certain foaming cleansers, as you can see below. The bottom cleanser is the Mizon Snail Repairing Foam Cleanser, which also generates a nice plush cushion of foam when used with a net, although not mind-boggling dense bounciness that the Perfect Whip creates. After seeing her husband, reportedly a diehard foaming cleanser fan, use his konjac sponge to lather up his cleanser in the image on the left, I gave it a try. Although it doesn't give me a massive cushion of foam like the net does, it works quite well for a quick morning wash with the sponge and it also lulls my fears about what sort of putrid bacteria might otherwise be attempting to form in my facial cleaning tool. As you can see in my tools collection picture above, my sponge dries out very quickly in the desert air so I am not quite as worried about what dankness might be growing in there, but I still like knowing that my cleanser is being worked down into the core of the sponge, cleaning it and my face both. Since I have to soak it every day before use, I usually start with scalding hot water from the tap and then let it sit so it cools and rehydrates at the same time. I will eventually be posting a review of the konjac sponge and comparing it to my Clarisonic, but that's for another day. I will say that it does clean better than just my hands + foaming cleanser, and that it mildly exfoliates as it goes, so be cautious with it. I prefer to use it with a foaming cleanser instead of a cream cleanser or water as I find I need a layer of lather in between the sponge and my skin, no matter how gentle I am with the sponge. Speaking of a 'lather barrier', that brings us to the last tool I use, which is the Clarisonic brush. If you aren't familiar with it, it's a sonic vibration brush made with the same idea as the Sonicare toothbrush; instead of scrubbing at your skin/teeth, vibrate that gunk off instead- hence the 'sonic' part. There are a lot of facial brushes on the market, but please know that the Clarisonic does not work by 'brushing' your face so much as vibrating it. I have never used any of the spinbrush type knock-offs, but a friend of mine who has used them for years recently got a Clarisonic and was amazed at how different it is. It also oscillates instead of spins, so it doesn't pull your skin the way a spinning brush does. That being said, this brush is a cleansing powertool and if you are using any sort of chemical exfoliation, this brush is going to be way too much for your skin. I used to use this brush every other day, and now that I am using an AHA daily peel (albeit every other day) the Clarisonic is like sandpaper. I still find I need it once a week or so, but it has now become my 'physical exfoliator' and I no longer use scrubs of any kind because they're just too damn harsh. When I do use my Clarisonic, I need a dense foam like the Shiseido or the Mizon Snail to create a barrier between my skin and the bristles of the brush, so it glides smoothly over my skin and vibrates things out of my pores without having too much direct contact. However, I have stopped using both of these cleansers, because both of them are a high pH level, which we'll talk about last. There's just a few I am going to mention here, as the rest are sprinkled throughout this megapost: washing your hands before you wash your face, washing against the grain of your skin, washing thoroughly instead of roughly, and rinsing like you've never rinsed before. Washing against the grain of your skin is something I first heard about by watching a Korean variety show episode where my one of my skin heroines, Go Hyun Jung, was discussing skincare with a member of kpop group Bigbang. Don't laugh. The kid in question was explaining how everything being shot in HD put pressure on him to have perfect skin, and how her cleansing technique gave that to him. They talked about 3 points I now use: never to touch your face without washing your hands first (I now religiously wash my hands with soap first, rinse thoroughly, and then dispense my facial cleanser onto totally clean hands), wash thoroughly for a few minutes, and to wash against the grain of your skin. Essentially this means instead of starting from the inside and sweeping out like you do with a toner or general skincare, start at the outside of your face, and using tiny circular motions, slowly work your way in towards the center. When I tried it, I immediately felt the clogged pores under my skin, and noticed that they came to the surface easier once I switched the direction of my cleansing of everything from the Clarisonic brush to oil massage. She also focuses on cleansing the skin properly and at length, as opposed to multiple cleansers or harsh products. Apparently she takes 15 minutes to wash her face, and although I don't take nearly that long, I do spend several minutes if I am using a gentle cleanser, circling against the grain using almost no pressure and with fingertips only. I also do not apply cleanser all over my face right away, even ultra-gentle Su:m37 Rose stick, because I don't want the dry areas of my combination skin (especially the apples of my cheeks) to be sitting in a bath of cleanser while I painstakingly cleanse my way to the center of my face. I actually apply the cleanser to my nose, forehead, and then around the outside of my face. Once it's on, I start with my nose (per Go Hyun Jung's instructions) and then move to my forehead, working from the outside in, and then from the edges of my face inward, leaving my ultra-dry areas last. If you follow Korean skincare trends, you may have heard that Suzy Bae (member of kpop group Miss A) uses a "424" method, which consists of 4 minutes massaging with a cleansing oil, 2 minutes of lathering with a foaming cleanser, and then 4 minutes of rinsing your face. People usually react to this with "AMAHGAWD who could possibly take four whole freaking minutes to rinse their face?!!" but Suzy is onto something, I tells ya. I don't use her method, but I do use Jen's (of frmheadtotoe.com) multiple rinsing technique, after watching a video were she mentions that she rinses her face ... 8? times. I can't remember. I decided to give it a go, and now I splash rinse my face (gently, like the woman in the below video) anywhere from 9-14 times after cleansing until it feels clean, and I am amazed that I never thought of this before; I would just splash my face with water until all the visual residue was gone and carry on. I used to get mega residue after cleansing when I swiped with a toner-soaked square of cotton, but no more! My cotton square wipes clean and my skin feels great. I regret not knowing about this earlier. Especially considering how dry it is where I live, I found this to be a very helpful technique to keep my skin hydrated until I could open the bottle or jar of whatever I applied next. If I am going to use a pH-balanced product routine, I will pat my face dry with a towel using the same outside-inward pattern I mentioned above, so my dry areas stay moist until the last possible second, then I rush to open my toner and get a few drops on my dry areas before they crisp up like a piece of fruit leather. I am eventually going to write a megapost about pH and why it matters (Update: Done! click here to read about 'Why the pH of Your Cleanser Matters'), but I have only been making pH-conscious choices in my skincare since mid-June (and it's now mid-August) and the jury is still out on the effect it is having on my skin. My skin tone and texture are improving, but my acne is not clearing up. The active ingredients I am using (AHAs and BHAs) do cause purging and therefore I am waiting it for at least 6 months before I make my decisions about it. As you know, I introduce new things very slowly into my routine, so it's going to take a lot longer than 2 months to judge the effects. You probably have heard pH being buzzed about especially in relation to toners, but it's worth really researching. I highly recommend that you read skinandtonic's excellent post about pH and the acid mantle here. For the love of hamster, never put baking soda (too alkaline) or lemon juice (too acidic) on your face. Seriously, delete those DIY scrubs off your pinterest and save your skin. Now that being said, I am still investigating the new world of pH balancing, so take all that with a grain of salt and know that if you have a cleanser that you really love, and you are happy with your skin and it's working for you, stick with it. I'd love to hear about the tips and tricks you have gleaned from your love of asian skincare, as well as any personal experiences you have with switching to pH-conscious skincare, so leave me a comment below, or shoot me a message on Facebook or Twitter! Note: As usual, I will be skipping next weekend's review due to this doublepost. My konjac trick is that if you want a lot of foam, squeeze it in double time than the gif and the foam will be denser! I usually squeeze it as fast as I can 3-5 times and I got a great tiny mountain of foam! Of course it depends on the cleanser but it does pretty well! what cleanser do you recommend with a good ph? Try "Rohto Hadalabo Gokujun Hyaluronic Acid Lotion." It's one of Japan's best seller - advertised that it is sold in one for every 4 second. They are so popular that Korea company now are working with them. I'm in Hong Kong right now for visit and all of this brand's products in beauty stores are labeled as "Japanese-Korean Product." What's more than perfect when the two best and professional beauty countries works together?! It is also "ACID!!" You should also try their other products. They have AHA and BHA cleansing too. Also have a line for sensitive skin. The Hada Labo HA lotion is definitely a long-term resident on my wishlist, actually! I just started reading your blog today and I must say, you really do write very informative posts. It's more lengthy than what others would consider normal blog posts, but you don't put a lot of blab into them. Instead, the reader gets quite an in-depth understanding of how and why these products work (or why they won't). I've just started really getting into skincare and I have already learned a lot from your posts. I once read a review where 75% of it was about the packaging, and then maybe two lines about the product itself. I love pretty packaging as much as the next girl, but a cute box/container doesn't matter if what's inside it isn't good, you know? I just love your blog!! I'm wondering if you had some time to Maybe help me out. Those 3 products will give you a basic routine that will be very affordable. Once you have those basics down, you can start looking at things that will improve your skin, such as chemical exfoliants and antioxidant serums, which are the bread and butter of anti-aging. BHA, AHA, and Vitamin C serums are all things that should help with the issues that you have, but you need to have a sunscreen + basic routine in place first. AHA is photosensitizing so a good sunscreen is non-optional. I have to agree with the above comment... you write very informative posts. Your blog has everything I like: discovery of something new (in this case, asian skincare), accurate and research-based information, and thorough and careful explanations. I found your blog just a few days ago so I have a lot of reading to do! I've been wondering about the pH for cleansers too. And my question is, wouldn't the water that we use during washing our face also raise the pH of the cleanser? I'm too lazy to use a foaming net/konjac sponge everyday and I'm thinking of using a foaming soap dispenser for my cleanser but you need to add water to those and I'm worried that it might make the cleanser too alkaline. I could have sworn I replied to this, whoops! My apologies! Water, as in pure water, both has a neutral pH but it's also inert as it does not dissolved materials that would pull the pH higher or lower. Tap water can be close to pH 7 but it could be has high as 9 depending on where you live and non-pure your water is. If you were going to add water to a product to dilute it, I would personally buy a jug of distilled water and use that, but you can always give it a shot and see if the pH comes out any different when it's mixed with your regular tap water? "Products will buffer one another's pH if you layer them (pH is a factor of 10), so if you put a pH 4 toner on top of pH 7 water, you're going to average the pH somewhere between them, which puts you out of the 'effective' pH of that toner, so dry your face before you apply a low pH product"
Water and cleanser will always come together during cleansing...so that means the water's pH would mix with the cleanser pH and meet somewhere in the middle, which in this case would be about 5 (healthy skin). Slowly reading through your blog every weekend =) do you have a video clip or paper drawing to show how to wash our face per Go Hyun-jung method? It feels "weird" when i tried it out! my hands wanted to move in the other direction. Also, was Go Hyun-jung book ever published in chinese or english?? It definitely feels weird! I always start from the outside of my face working in small circles toward the inside. It's against the grain of how peachfuzz grows on one's face. Really loving your blog! I have a question for you reguarding cleansers. For the last 4 months I have been doing AB and only using a emulsifying oil cleanser, no second cleanse as I don't wear any makeup. I recently purchased the MRCS and used that as my only cleanser, and it is just not working out. I'm wondering if I should maybe try using it as a second cleanser and see if that works? If it does not, what would you reccomend for a good second step cleanser? Please help me! I have mixed sensitive skin wich was just great before I started using Missha time revolution essence last week, an my face brokeout like Christmas cake!!! I use micelar water to remove my makeup and the wash it with the hada labo foaming soap ( the one in a tube). Then I put on the missha essence and the rest is history. I've read many blogs and my conclusion is this: my skin is not purging, but reacting to it's pH! I concluded this because I read missha's essence pH is 7. I really want it to work for me so I've all of your related posts and wanted to ask you... is I use an AHA BHA gel cleanser and then put the essence on, what will my pH be!?!?? Will it be more acidic than 7?? Super thank you! !